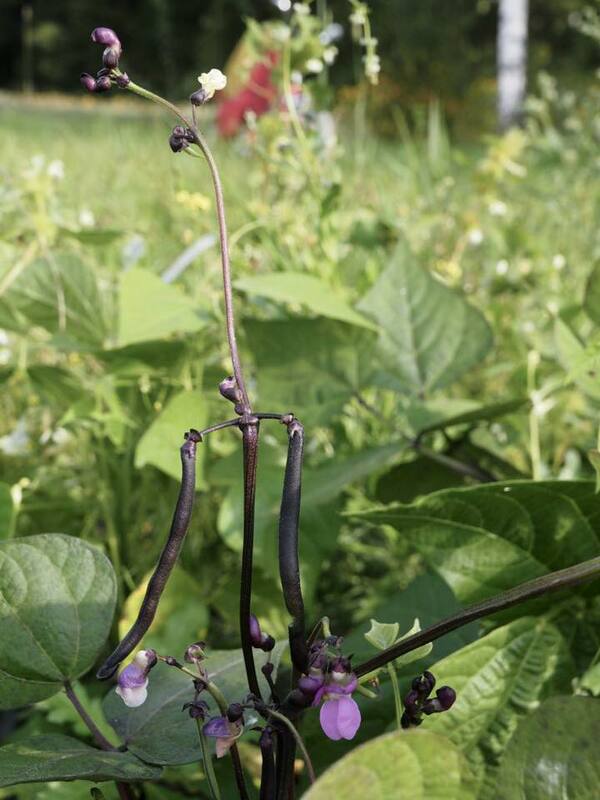 On our French bush beans delight, fall event dates and important upcoming Winterseason info! Huom! 8.10.2018 / omamaafi / Kommentit pois päältä artikkelissa On our French bush beans delight, fall event dates and important upcoming Winterseason info! Huom! Our farming in September was of course a continuation of our farming in previous months. These July, August and September newsletters will be informative for you who joined only recently. This newsletter is being sent out as another IPCC climate change report has hit the headlines. Our Omppu Tonttu tila comrades in Lahti put it like this : “if you want to mitigate climate change fast and easy: eat organic. If our cultivated lands would be average organic fields, the effect would be about 3500kg/ha/year CO2 binding capacity. If our cultivated lands on the other hand are using chemical fertilizer, industrial products, they would be releasing about 1000kg/ha/vuosi CO2. The positive effect of organic farming is then about 4500kg CO2/ha/year. Every year!” Take that.. The kohtuusliike (finnish movement for “life in moderation”) came out with these very nice 10 climate demands, several of them relating to agriculture, the possibility for people to shift away from detrimental jobs as offered by a basic income, and this shifting away then linked to the objective of self sufficiency. As such the debate around also the relevance of Oma Maa’s raison d’etre continues in public. On a yet closer to our grounds level 🙂 we have been asked to be more specific also regarding that what fared less well this summer season. The previous newsletters have already been referring to this, but different non-succeedings are to be attributed to on the one hand the heat and drought this summer season. So for instance our onions, garlic, härkäpapu, broccoli, cabbage, red cabbage, zucchini, basil, water melon suffered. On the other hand, and for sure exacerbating the weather factor, has been the fact that quite a lot of our attention and energy went this year, for a considerable part, to the building up of (the functioning and capacities of) a new team on the farm, the first year start up of the kasvihuone (and a lot of learning has been done regarding also what to do differently inside our greenhouse for next year), and the efforts around our edible forest. With regards to the outside planting then, what then eventually succeeded well, like our french bush bean season, was mainly due to a second round of planting. The above notwithstanding, in September our bags only got fuller and heavier. As someone counted it up one bagday, our foodbags were starting to weigh some 8kgs! We had a good quantity of French bush beans in our food bags, as also of broad beans from our cooperative partner, Kaukon tila, which freshly cooked, tasted simply like sweet. In our bags also sweet chocolate pepper and apple juice! As well as those very tasty and prize winning Colomba potatoes. At the moment we are planting every week in the greenhouse – asian leaves, mangoldi, spinach, pak choi etc. upcoming! From the land, we are still awaiting beetroot and carrot, but also parsnip and piparjuuri and of course more lanttu and nauris. @the farm In the beginning of September we had a recycling and handcraft event – a very well visited and warm going about on the farm! With basically all the prepared for the occasion Oma Maa bread and falafel sold out. & off the farm On the second week of September we had a cafe in the intermission of the Rakkaudesta performance in Cirko in Helsinki. Food members prepared and served small pastries, berry juice and infusion from seasonal ingredients from the farm and spread the word about our coop. Into the Winter season – Attention / Huom! We will be EXTENDING our summerbag season up and until thursday 20.12.2018. Whole bag orders will be receiving extra items in their bag to making up for the last week of the year (and our aim is to do this in the form of some christmas Oma Maa treats). Half bag orders who would have had a bag in the last week of December, will be requested to pick up their bag one week earlier – and we will of course check for the content of the bags keeping in mind we are speeding up your pick up rhythm. So in summary, no bags on Tuesday 25th and Thursday 27th but everyone will have a bag to pick up on week 51 (Tuesday 18th / Thursday 20th). October-November try out members’ order will automatically end by the end of November but you can join the coop starting from December and order the December bag as a member. Following the ending of the summer bag season, there will be a two weeks production break for the last week of December and first week of January. We will commence with our winterbag season in week 2 of 2019. Our winterbags will be smaller, and thus cost less (120 euros a month). As there are five weeks in January, we are at the moment thinking that neither whole nor half bag orders need any compensative measures – both groups, even and uneven weeks, will get 4 or 2 pick up days. But this is something we can still get back to later, if this feels to be necessary. Pending the total amount of orders, there will be one or two pick up days in the winter season. As such we will still continue having try out periods for the two months periods throughout the winter, adapting pick up days offers for the December and January month. We will then be putting out soon a questionnaire as to when everyone thinks the winter season should be ending, and when the beginning of the summer season 2019 should start. But perhaps more relevant, and as a part of the questionnaire, we will also be asking your opinion on some options we thought of. So we for instance discussed the offering of a month’s break in an ongoing bagorder, for which we would charge a small fee (like 20 euro) related to the fact that we should then be finding additional try out members to fill the gap in income and to the fact that we are then nevertheless working for the products to be coming up in the bags following the break (the production in the co-op requires constant income even if breaks are taken). Another option we have thought of is to facilitate a simple system allowing you to be gifting your bag during a month (or half a month) to a friend or perhaps to a good cause. So the exact ending of our upcoming winter season and start of next year’s summer season is something we will still be discussing collectively. Further organising and deepening our Coop – over a delicious Oma Maa dinner! On Friday 26.10.2018 our farmers and cooks Jan and Jukka will be cooking a dinner for us – with the aim to both practice the taking up of the making of dinners in the cafe again, as well as to give us the great opportunity to deepen the discussions around the development of our coop over a fantastic dinner. We will not be asking for a fixed price for the dinners, but probably make a suggestion concerning a collection pot present. So we will be leaving it up to you with how much you would like to contribute for this cooperative dinner. 13 October: Talkoot with breakfast and guided tour at the farm. If you’ve never visited the Lassila farm or otherwise are curious, this is your opportunity! Before talkoot we will make a short guided tour at the farm and take a walk in our food forest. Please check the event on Facebook for its agenda and other details. 27 October: Talkoot with breakfast. If you want to start a new day with co-op members you’re welcome to join for the breakfast! You can also join just the talkoot. Please check the event on Facebook for its agenda and other details. Please dress according to the weather. Rubber boots are highly recommended, and in case of the rain we recommend a raincoat. If you are coming to the talkoot by car and can take people with you please let us know in the talkootyö-form (link in the email version of this letter)! Kekrijuhla/Harvest feast 3.11! More info still following! – but we will be having our traditional Harvest feast marking the beginning of winter on Saturday 3.11. And in addition to the above – Welcome to join for talkoot during any weekday at the farm or any pick-up day at the cafe! You can sign up to work at the farm or in the cafe on pick-up days as well as offer or find a ride to and from the farm via the talkoot form (link in the email version of this letter). Read also again the complete overview of our talkoot workings. Syyskuun viljelymme oli tietysti jatkoa aiempien kuukausien töille, joten tässä on linkit heinä-, elo- ja syyskyyn jäsenkirjeisiimme, joista voi löytyä mielenkiintoista tietoa hiljattain mukaan liittyneille. Kohtuusliike julkaisi hiljattain nämä 10 kohtuullista ilmastovaatimusta, jotka liittyvät mm. maanviljelymenetelmiin sekä ihmisten mahdollisuuteen siirtyä pois ilmastolle haitallisista palkkatöistä perustulon varassa samalla omavaraisuutta vahvistaen. Näin siis julkisessa keskustelussa ovat esillä Oma Maan perimmäiseen tarkoitukseen liittyvät aiheet. Palaten maan pinnalle ja viljelyasioihin: meitä on pyydetty tarkemmin kertomaan myös siitä mitkä viljelykset menestyivät heikommin kesäkaudella. Aiemmissa uutiskirjeissä näihin asioihin on jo viitattu, mutta yhtenä haasteena tänä kesänä on tietenkin ollut kuumuus ja kuivuus. Sääolosuhteista kärsivät mm. sipulit, valkosipulit, härkäpavut, parsakaali, valkokaali, punakaali, kesäkurpitsa, basilika ja vesimeloni. Toisena haasteena ja sään aiheuttamia haasteita edelleen hankaloittavana on ollut se, että tänä vuonna paljon huomiota ja energiaa on mennyt uuden viljelytiimin toiminnan ja osaamisen kehittämiseen sekä kasvihuoneen ensimmäisen vuoden kokeiluihin ja ruokametsän kehittämiseen. Nämä panostukset ja samalla saadut opetukset helpottavat viljelyä tulevaisuudessa. Lopulta ulkoviljelyssä saavutetut menestykset joidenkin kasvien, kuten pensaspapujen, kanssa olivat lähinnä toisen istutuskierroksen ansiota. Edellisistä huomioista huolimatta syyskuussa satokasseistamme tuli yhä runsaampia ja painavampia. Joku laski yhtenä satojakopäivänä kassien painoksi arviolta 8 kiloa. Satokasseissa oli paljon pensaspapuja sekä härkäpapuja, jotka tulivat yhteistyökumppaniltamme Kaukon tilalta. Satokasseista löytyi myös mm. paprikoita ja omenamehua sekä tietysti makoisia Colomba-perunoita. Tällä hetkellä istutamme joka viikko kasvihuoneessa ja sieltä on jatkossa tulossa mm. aasialaisia lehtivihanneksia, mangoldia, pinaattia, pak choita yms. Pellolta odotamme vielä punajuurta, porkkanaa, palsternakkaa ja piparjuurta sekä tietysti lisää lanttua ja naurista. Tapahtunutta tilalla. Syyskuun alussa tilalla oli lämminhenkinen ja hyvin osallistujia kerännyt tapahtuma “Kierrätettyä ja käsintehtyä Lassilan tilalla”. Käytännössä kaikki tilaisuuteen valmistettu Oma Maan leipä ja falafel myytiin loppuun. & tilan ulkopuolella. Syyskuun toisella viikolla toteutimme väliaikatarjoilut esitykseen Rakkaudesta – sanasto tuleville vuosikymmenille Cirkossa Helsingissä. Osuuskunnan ruokajäsenet valmistivat ja tarjosivat tilan kauden aineksista valmistettuja pieniä leivonnaisia, marjamehua ja hauduketta sekä levittivät sanaa osuuskunnastamme. Tulemme JATKAMAAN kesäkautta joulukuulle torstaihin 20.12.2018 asti. Kokonaisen satokassin tilaajat tulevat saamaan lisätuotteita kasseihinsa lyhyemmän kuukauden vuoksi (ja tavoitteena on toteuttaa tämä jouluruokien muodossa). Puolikkaan satokassin tilaajat, joilla olisi kuun viimeisellä viikolla hakupäivä, pyydetään hakemaan satokassinsa viikkoa aiemmin – ja kassin sisällössä pyritään tietysti huomioimaan tämä nopeutettu rytmi. Yhteenvetona siis satokasseja ei jaeta enää tiistaina 25.12. ja torstaina 27.12., mutta kaikki tilaajat tulevat saamaan satokassin viikolla 51 (ti 18.12. / to 20.12.). Loka-marraskuun kokeilijoiden ei tarvitse erikseen ilmoittaa vaan kokeilu päättyy marraskuun loppuun, mutta jäseneksi voi liittyä joulukuun alusta ja joulukuun kassin voi tilata jäsenenä. Kesäkauden päätyttyä pidämme kahden viikon tauon tuotannosta (joulukuun viimeinen viikko ja tammikuun ensimmäinen viikko). Talvikausi alkaa vuoden 2019 viikolla 2. Aiempien vuosien tapaan talvikassimme tulevat olemaan pienempiä ja siten halvempia (120 e / kk). Tammikuussa on viisi viikkoa, joten tällä hetkellä ajatuksena on, ettei ensimmäisen viikon viljelijöiden loma vaikuta muihin viikkoihin. Kokonaiseen tilaukseen tulee joka tapauksessa 4 ja puolikkaaseen tilaukseen 2 hakupäivää. Tähän voidaan kuitenkin tarvittaessa palata myöhemmin. Riippuen talvikauden tilausmäärästä hakupäiviä tulee viikossa olemaan yksi tai kaksi. Kahden kuukauden kokeilumahdollisuutta tulemme jatkamaan läpi talven. Lähiaikoina tulemme myös lähettämään kyselyn siitä milloin talvi- ja kesäkauden vaihdoksen tulisi ensi vuonna sijoittua. Mutta ehkäpä vielä oleellisempana asiana tulemme osana kyselyä kysymään mielipiteitänne harkitsemiimme tilauksen tauon mahdollisuuksiin. Esimerkiksi on keskusteltu mahdollisuudesta jatkuvassa tilauksessa kuukauden taukoon, jonka ajalta veloitettaisiin kuitenkin pieni korvaus (esimerkiksi 20 e) liittyen siihen, että tauon ajaksi meidän tarvitsisi löytää lisää kokeilijajäseniä tulojen vähenemistä korvaamaan sekä siihen, että tauon aikanakin työtä on tehtävä tulevia satokasseja varten (osuuskunnan tuotannon jatkuvuus vaatii jatkuvia tuloja vaikka taukoja tilauksissa pidettäisiin). Toinen harkinnassa oleva mahdollisuus olisi helpottaa kassin lahjoittamista kuukauden tauon ajaksi ystävälle tai hyväntekeväisyyteen. Tulevan talvikauden päättymisajasta ja kesäkauden alkamisajasta tullaan siis vielä keskustelemaan. Osuuskunnan yhteisöllisyyden ja sisäisen keskustelun syventämistä illallisen äärellä! Lokakuuta: Talkoot, joihin kuuluu aamiainen ja opastettu tilakierros. Jos et ole koskaan vieraillut Lassilan tilalla tai olet muuten kiinnostunut, tämä on hyvä mahdollisuus! Ennen talkoita teemme lyhyen opastetun kierroksen tilalla ja kävelyn ruokametsässämme. Lisätietoja löytyy Facebook-tapahtumasta. lokakuuta: Talkoot aamiaisen kera. Jos haluat aloittaa uuden päivän osuuskunnan jäsenten kanssa olet tervetullut aamiaiselle! Voit myös osallistua pelkästään talkoisiin. Lisätietoja löytyy Facebook-tapahtumasta. Pukeuduthan sään mukaisesti. Jalkineiksi suositellaan kumisaappaita ja sadepäivänä suosittelemme sadetakkia. Jos olet tulossa talkoisiin autolla ja voit ottaa muita kyytiisi, ilmoitathan siitä talkootyö-lomakkeella (linkki tämän uutiskirjeen sähköpostiversiossa)! Lisätietoa tulossa lähempänä! – mutta tulemme pitämään lauantaina 3. marraskuuta perinteisen sadonkorjuujuhlamme, joka merkitsee talven alkamista. Tervetuloa talkoilemaan myös minä tahansa arkipäivänä tilalle ja satojakopäivinä kahvilalle! Voit ilmoittautua hommiin tilalle ja satojakoon sekä tarjota tai löytää kyydin tilalle talkootyö-lomakkeella (linkki tämän uutiskirjeen sähköpostiversiossa). Lue myös laajempi yhteenveto talkoomahdollisuuksista ja talkoosuosituksesta. Toivottavasti tapaamme teidät kaikki ennemmin tai myöhemmin tilalla! Viimeisimpänä, muttei vähäisimpänä seuraava avoin hallituksen kokous on kahvilalla tiistaina 16. lokakuuta klo 19:15 satojaon jälkeen ja se on avoin kaikille jäsenille. Kokousten esityslista päivitetään aina tähän dokumenttiin.